It’s a simply, sweet little message to encourage you to focus on your purpose. 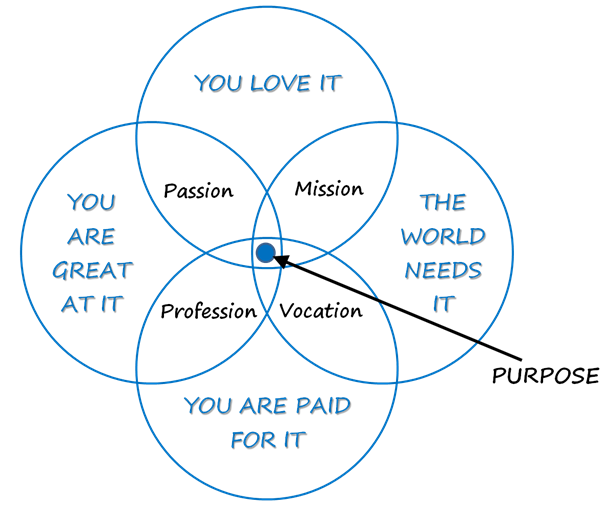 The thinking is that purpose is found at the intersection of Passion, Mission, Vocation & Profession. Or in other words, purpose is a combination of loving what you do, being great at it, being paid for both of these and because the world needs it. It’s also paper thin nonsense. Plenty of us can feel that we are fulfilling our purpose through one, two, or three of the four of the components. For an organisation it has perhaps more relevance but even that doesn’t stand up to much scrutiny… Plenty of organisations fulfil their apparent purpose with one or two of the four components. Thinking of purpose beyond our working lives the graphic says nothing about family, friends, interests or our place in this world. I believe those all influence our sense of purpose. Purpose isn’t found where you are told to find it. Purpose is found where you fulfil it. You won’t find it in the “paper thin”. When I first saw this diagram I quite liked it. Your blog has made me think. My revised thoughts are that it has some value to stimulate debate, but is actually quite one dimensional – applying to the work context as you say, and probably only relevant for those who feel a strong vocation for what they do. I wonder what a diagram representing the whole picture could look like? Hi Annette – initially I had a similar response to the appeal of the diagram. My eye was drawn more to what it was not showing in the 4 small intersections just outside of the centre. Thinking more about it though… well, you saw where I got to! As a way to delve deeper into the topic of purpose I think it has some use provided it is facilitated with a broader appreciation of the graphics own limitations. Perhaps then the whole picture is not something we create for others but something we help others explore. The diagram as a starting point rather than a complete “map”. The hype that one needs to have a purpose in life that meets all four components, could actually be quite stressful or cause a sense of incompletion. One may be doing something that doesn’t make the world a better place, or doesn’t make them jump out of bed each morning and shout “it is another fabulous working day”, yet, it pays the bills and doesn’t require one to work extra hours, so one can spend time with loved ones or do something else that makes one smile. And there is nothing wrong it that, it doesn’t need to be changed, nothing is missing, because of the lack of a purpose as per the definition of the graphic. So thank you for your post. I too, initially liked the graphic, and many years hoped to end up in the middle, feeling accomplished, full of purpose. And then I woke up to reality, and learned to look at all those fabulous things present in my life that, as you rightfully say, are so relevant for that sense of purpose/fulfillment/happiness.